All our adult diapers and incontinence products with wetness indicators are below. Some adult diapers with wetness indicators are easier to know when to change. When they get soiled or wet, there is an insert in them that changes color and lets you know when to change them. It can save on the cost over time and give you peace of mind that you know when to change the product. Some people can't tell when a diaper has been soiled or wet, or they want to be very accurate with when to change things. These products are for them. 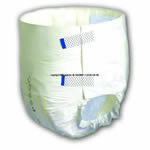 Adult diapers with wetness indicators are preferred by many that need to be let known that the diaper has been used.